As much ire as the McDonald's corporation has drawn from anti-globalization crusaders, litigious customers, and a filmmaker named Morgan Spurlock, burgers will always remain a staple of the American diet, for better or for worse. But if you're going to stuff your face with a hamburger while also cramming greasy french fried potatoes down your gullet, only to wash it all down with a chocolate milkshake chaser, then you might as well make it good one. Why eat something that's bad for you that's also bad-tasting? When I need a good, cheap, fast-food burger, I go to either In-N-Out or Fatburger, two chains that beat the Golden Arches by a mile and a half. And they make no apologies that they peddle burgers; fast food burgers which are fatty, luscious, grease bombs, dripping in shiny coat of melted American cheese -- not Fruit and Walnut Salad. In-N-Out had the right idea when they recruited the ample-figured actor, John Goodman as their spokesman. His gravelly, baritone voice-over crooned about a perfect In-N-Out lunch on L.A. radio drive time -- the kind of meal that only a fat man could credibly endorse. But they stopped short of showing Mr. Goodman on television with a Double-Double in hand. In-N-Out marketers may be direct, but they aren't stupid. 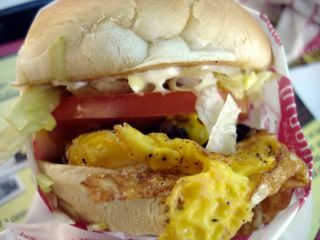 My favorite fast-food chain burger is found at Fatburger. This is the kind of place that harkens back to a time when a burger was good wholesome food for good wholesome people. Red, shiny soda fountain bar stools, chrome accents, and a jukebox pleasantly distract from the fact that the word "fat" is actually in their name. But more ballsy than that is the option they offer of putting a whole fried egg in their sandwiches. This tasty addition amps up the cholesterol and saturated fat count to...well, I don't wanna know. Point is, it's such a perfect combination that I wonder why other joints don't follow suit. The egg complements the ground beef patty, not masking but enhancing the beefiness in a way cheese never could. Ordering the "Baby Fat" is the usual way I mitigate eating a burger with an egg. Slightly bigger than a White Castle slider and also a lot heftier and thicker, the "Baby Fat" is still the smallest of the brood at Fatburger -- but it's enough of a meal for me when accompanied with a mound of crispy Skinny Fries and those delectably crumbly Homemade Onion Rings. Bigger eaters can order the name sake Fatburger or the regal-sounding but gut-busting Kingburger, which will put anyone on a fast track to look like the Man himself, John Goodman. Noodle soup is warm sustenance for the stomach, comfort food for the soul -- but above all, it's a cheap, hot meal for cold, wet weather. At Noodle Avenue** in Tustin, a steaming bowl of it is brought to me faster than an In-N-Out Double-Double takes to cook and is ten times more satisfying during a downpour. My current addiction is their House Noodle Soup ($4.75), which like the other noodle soups they offer, comes with a question: Will it be udon, thin rice, wide rice, or egg noodle? I chose egg noodle. 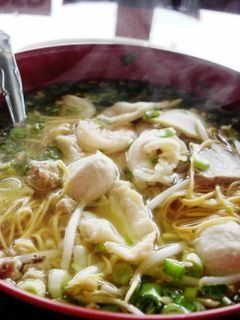 The canary yellow strands, as thin as angel hair but with more bounce and body, is submerged in a shimmering broth -- a hot soup bright yellow and clear with flavor culled and coaxed from simmering pork and chicken. On the side, always, is a plate of raw bean sprouts and a wedge of lime for squeezing. Then on go the toppings. What I like best about the House Noodle is that it comes with a little bit of everything. First, there are the meat balls. Formed into pinball-sized orbs from a mousse of pureed beef and tapioca starch, these pasty grey spheres bob like buoys and are just as springy when bitten. Functioning more as a textural foil, they are mild in flavor. Chicken comes in the form of blanched, thin slices as spongy and wispy as a cloud. The white meat shavings playfully float along with floppy, rectangular pieces of fish cake, itself stark white and pock-marked with air holes. Curled in a fetal repose and as pink as a cherub are the steamed shrimp. There are three swimming in the broth, each jiggly and crystal fresh. Think that it ends there? Not yet. There's the pork, which comes in two styles; a thick dark slice from a roasted loin and pebble-sized nuggets of the ground meat. The latter dots the broth, lending a coarse but meaty chew, while the former is reminiscent of tender char siu. A garnish of chopped scallions, golden fried bits of garlic, and cilantro completes this cold weather remedy in a bowl. But the MVP is the garlic. These flavor crystals burst with enough power and punch to make the town of Gilroy proud. But more importantly, it imparts a distinctively pungent sweetness to the broth. With my mouth straddling the brim, the wide bowl slowly eclipses my face as I tilt it to guzzle the soup down to the very last drop. I smacked my lips and let out a satisfied sigh. Outside, rain pelted the ground, but I was warm and full. **UPDATE: 8/6/2008. Noodle Avenue has closed. It must be a bummer living life as a bivalve. Especially if you're a bivalve living in a tank at a seafood restaurant. One minute you're as happy as, well, a clam, minding your own business, siphoning water, combing it for nutrients. Then the next minute, you're scooped up, dropped into some sort of vessel you can't even try to crawl out of, because, let's face it -- no legs. And there you stay, as blind and immobile as a rock, while your buddies are piled up on top of you in one sweaty mosh pit of your own shells. Then you get doused with wine. It's about this time that you wonder, "We finished the Tour de France or something?" But just before you find out if you did, that little room turns into a sauna with the knob set to "Murder", and it gets hotter, and hotter, and hotter. And then, just as suddenly as this started, "POP! ", you die -- your shell swung open, your guts hung out in the open for all to see. But your humilation doesn't end there. Nay nay. It continues post-mortem, as your naked bodies are splayed out on a plate and trotted out into this big room with lots of smiling happy faces, all staring and salivating at your glistening corpses. What's more insulting perhaps, is that the hot, steaming liquid which caused your premature demise is set aside in the center of the same plate in a deep bowl, presumably so that you can be dunked into it before you are consumed in a big sloppy slurp by some guy who paid $12.45 to have you as an appetizer. Last Friday night, the guy slurping, was me. 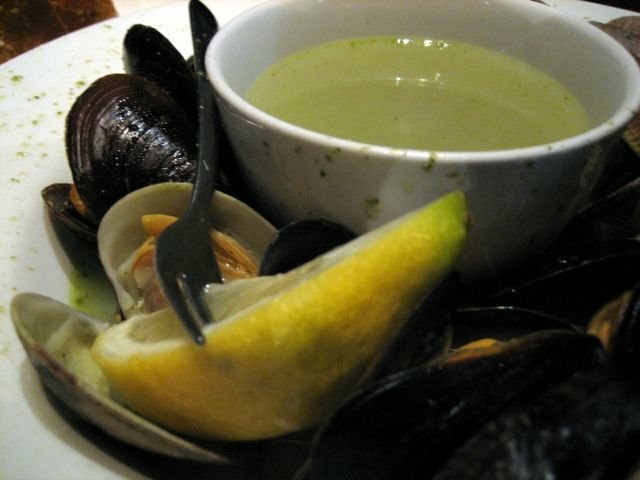 But those delicious little mollusks did not perish in vain. Perfect and squiggly fresh, with a tender meaty chew and a sweet metallic tang, each lovely morsel we sucked down made us giddy with glee. That bowl of brothy liquid was indeed perfect for dunking those fleshy ocean jewels before each hearty gulp. Full of body from the dripping mussel and clam juices, fortified with a touch of wine, and enlivened with a fresh burst of lemon juice, it was good enough to sip like a fine consomme, which I did. I had to apologize later for growling at the waitress when she tried to take the almost empty bowl away. Oh no, not yet. 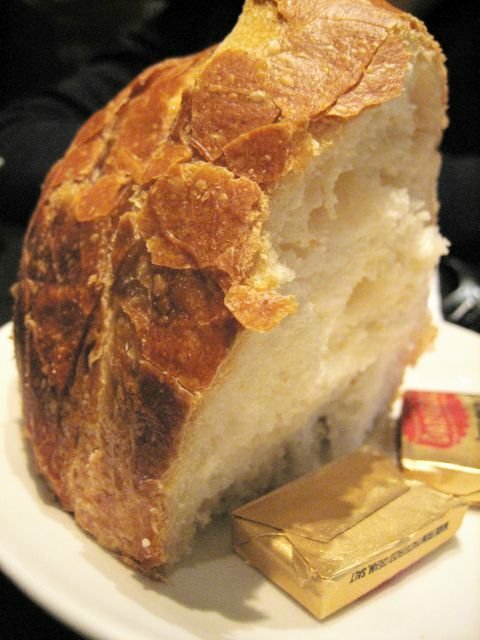 Not before I sop out each drop with this torn piece of crusty sourdough. 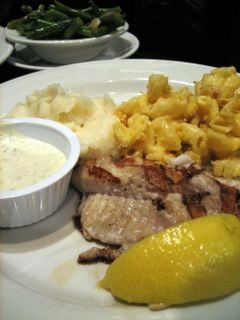 Suffice it to say this dish is the reason we come to King's Fish House, an outpost of the chain in the parking lot of the Laguna Hills Mall. Judging by the cuddling couples on dates and families noshing on seafood, more than our share of sea-critters met their ends that night. But they couldn't have picked a lovelier room as their final destination. The open dining area is classic in design -- a fisherman's trophy room mixed with a splash of art deco. 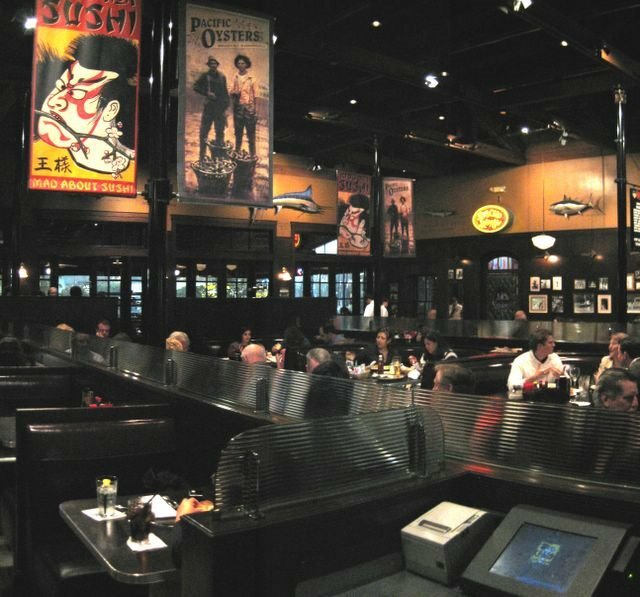 Silkscreen banners and mounted fish decorate the space, and panes of corrugated glass separate each dining booth. After the euphoric highs of the appetizer, we opted for the simple and the cheap for our main course. Farm Raised Channel Catfish ($14.95) was one of the less expensive items on the entree side of the menu. For the dish, a generous cut of fish is charbroiled and served with two "sidekicks." Since the portions are ample, we opted to share one order. The kitchen graciously split the meal on two separate plates for us at no extra charge. 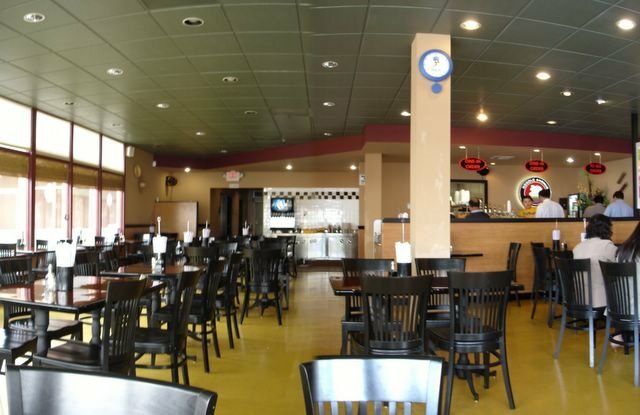 To augment our starchy choices of Homemade Macaroni and Cheese and Garlic Mashed Potato for the sides, we also asked for an extra order of Green Beans Amandine ($2.25). The catfish, although a bit gristly and chewy in parts, was grilled properly with nice charring and came with a ramekin of their zippy, house-made tartar sauce . The side of potatoes was creamy and the mac 'n cheese came dusted with crispy breadcrumbs. But the green beans were unevenly cooked. Some of the pods were limp and blanched while others were green and crisp-tender. For dessert and a taste of sweet decadence, we had the Rustic Apple Tart ($5.50). Sour green apple slices are stacked on a phyllo dough raft, crowned with a scoop of vanilla ice cream and smothered with gooey caramel sauce. The pairing of caramel and apple is a no-brainer, here presented in a sort of deconstruction of the county fair staple. 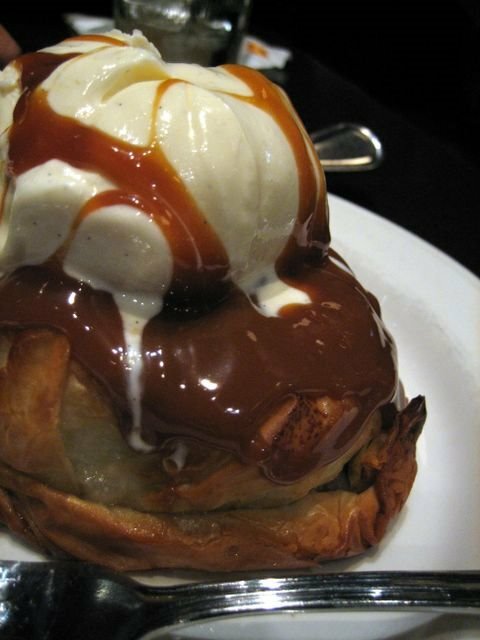 But compiling them with the phyllo crust and ice cream is pure genius. The phyllo flakes and crumbles adding a contrasting textural component to the melting ice cream. In the meantime, the crisp sour apple and the sticky caramel dance in a waltz of sour and sweet. In the end, after that meal, we felt as happy as, well...you know. 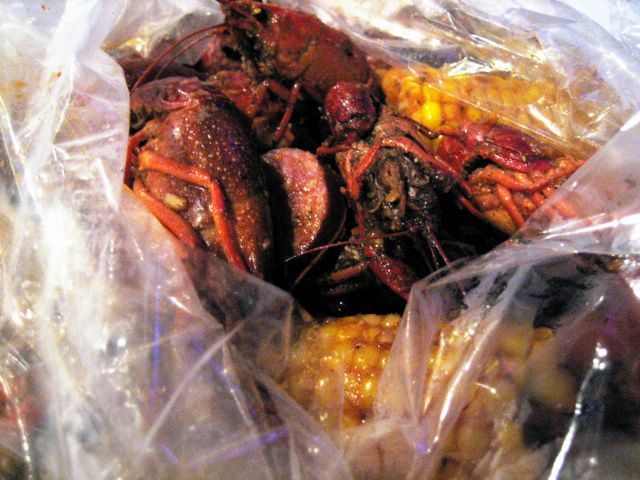 A recent Chowhound find reported by jaydee and followed up by Hershey Bomar was Boiling Crab, a Cajun-styled, Vietnamese-owned, seafood boil restaurant located on the fringes of Garden Grove's Little Saigon. Although the restaurant is one of many Cajun crawfish joints to recently pop-up in the area, on the Saturday night of my visit, it was filled to capacity and the wait list was two pages long. Two doors down, a coin-op laundromat did its own steady business. And with Boiling Crab's wait time lasting well over an hour, I estimate that a load of laundry was washed, dried, pressed and folded by the time our table was ready. 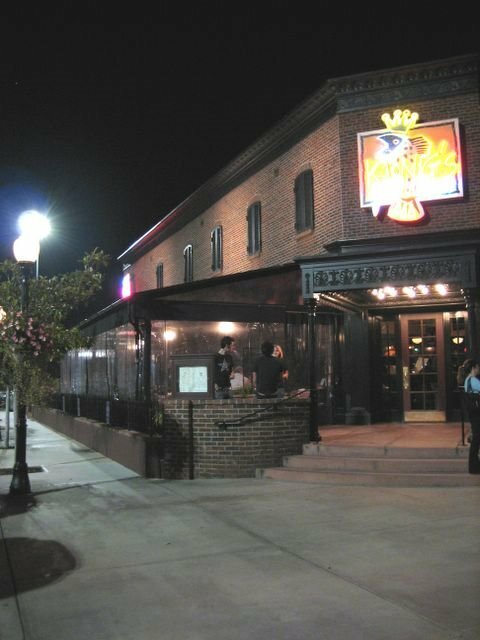 Since the restaurant took no reservations and its rectangular room was no larger than a stripmall pho joint, most of the crowd milled around outside, on the sidewalk. Those waiting and standing were predominantly college-aged Asians, who smoked like fiends and swore like sailors. 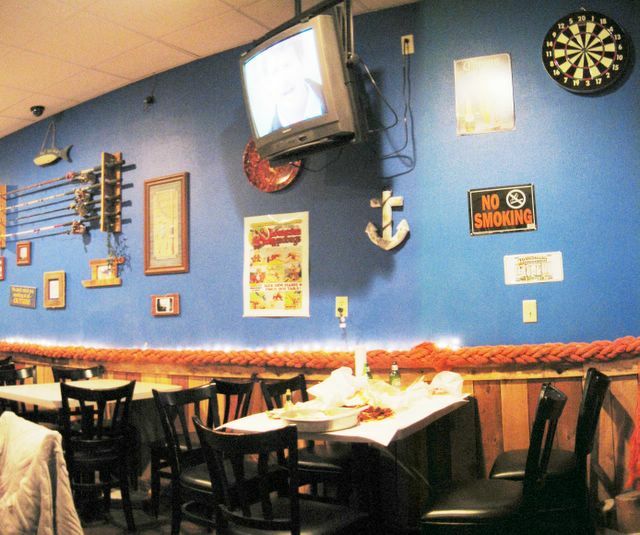 The kitschy decor of the place, which feels like a hastily put together nautical theme night at the high school dance (a fake anchor here, a fishing net and a life preserver there), seemed contradictory to the crowd. The point of the evening was not to bask in the theme park ambience, but to feast on crawfish, shrimp and crab. Small mountains of spent shells, heads, crawlers, and bald corn cobs littered the tables, along with sweaty bottles of Coronas and sytrofoam cups of soda-pop. Upon being seated, butcher paper was laid out on our tabletop for soaking up stray juice. Asking how we should order, our young waitress explained that the rule of thumb is a pound of crawfish per person at a market price of $7.99/lb. The first two pounds includes one small corn on the cob and sliced Cajun sausage. 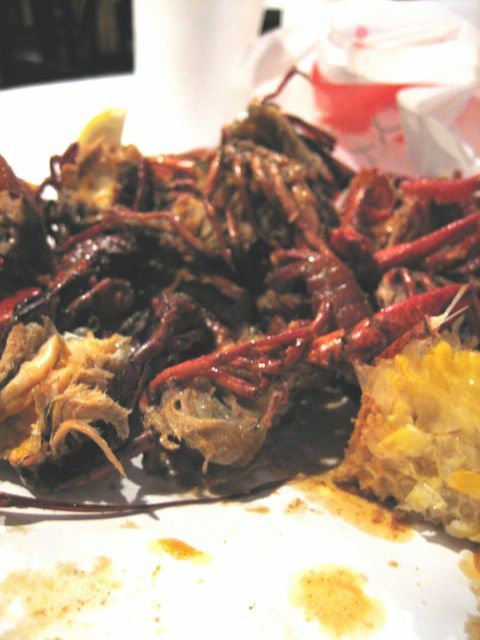 We ordered three pounds of the mudbugs seasoned with "The Whole Sha-Bang", a mixture of hot Cajun rub, roughly diced garlic, lemon juice, and melted butter. We also asked for some extra corn ($0.50 each) and sausage ($2.99). 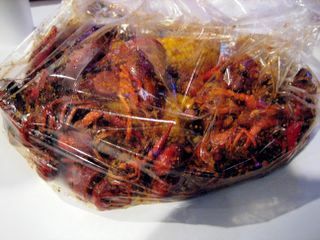 Peering through the clear plastic bag, the crawdads looked like aliens, the kind which leap out during the climax of a movie to chew on people's faces. But it was us who decimated them. We twisted the heads off the buggers, wrapped our puckered lips around them, and sucked out the fatty/spicy juice from the skull, laughing like maniacal madmen. To get at the pasty tomalley beneath the thorax, we pried the feelers apart from the body, ripping it off with a sickening crunch. Their pea green innards had a mossy taste, faintly sweet and swampy. The tail we saved for last. This was the money meat. We pinched the aft section of the dorsal fin to force the succulent morsel out, and detached it daintily with two fingers. The thimble-sized hunk of flesh was tiny like a shrimp, but tasted like its bigger cousin, the lobster. However, our assertion of dominance on the food chain was short-lived, as the mudbugs exacted its own revenge against us. Its weapon of choice was the pepper red brew it wore like a protective force field, which left our lips throbbing. Thankfully, the "mild" spice level we chose was only pleasantly numbing at this stage of heat, but at higher dosages it would be downright radioactive and lethal. 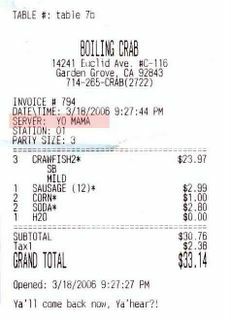 In the end, we had built our own little hills of litter piled high with the hollowed out shells of crustacean carcasses, soiled WetNaps, and a bill which was comparatively smaller than the carnage we left behind. 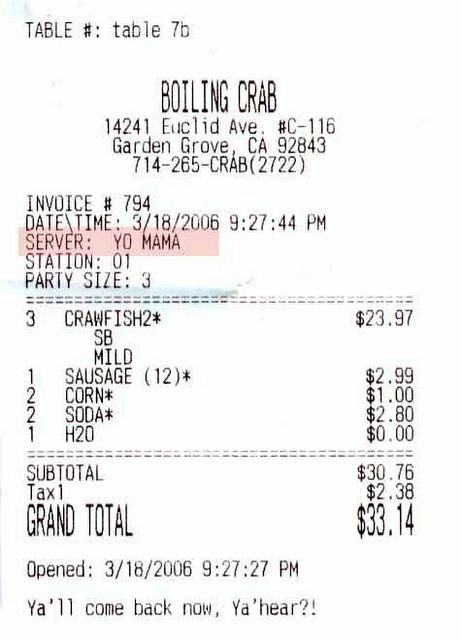 But in a last ditch effort of insolence, notice what those little mudbugs managed to get the nice servers to print on the receipt. "Yo mama," indeed! You may have won this round, my wily adversaries, but I'll be back later with more friends and lemon wedges.